Recycling garbage in Sofia, Bulgaria! 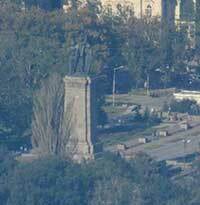 It is shameful and sad to me that the two most recognizable monuments in Sofia are an honest abomination! 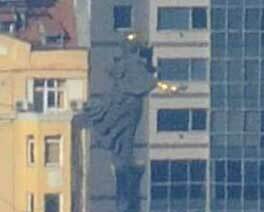 The lady with the owl and the protruding breasts, called by many "the Statue of St. Sofia", has nothing to do with the Holy Wisdom of God – St. Sofia; accordingly, it has nothing to do with the city of Sofia. This metal tourist attraction, named to be the emblem of the capital, is an ugly symbol of the profaning of our morals! On the other hand, the monument of the occupying Red Army is the largest monument in the center of the capital of Bulgaria. As such, it should represent a materialized expression of the nation-wide appreciation for the army’s glorious deed. The army, which invaded Bulgaria for no reason and was the reason for the killing of more than 40 000 Bulgarians without trial, which poisoned the Bulgarian land with the bloodiest ideology in all of human history, is entitled to no respect! This monument is still in place only because of the cowardliness of a bunch of thugs, who are afraid to irritate the more powerful, but do not mind crushing the weaker ones.